And by twine I don’t mean building a game from bits of string and duct tape, but rather using Twine, the “open-source tool for telling interactive, nonlinear stories”. It’s basically a supremely easy way to build a “Choose Your Own Adventure”. So that’s cool, but even cooler (to us) is how useful it is to designing events for Clockwork Empires. “This is madness!”, you say, but no – this is Gaslamp! 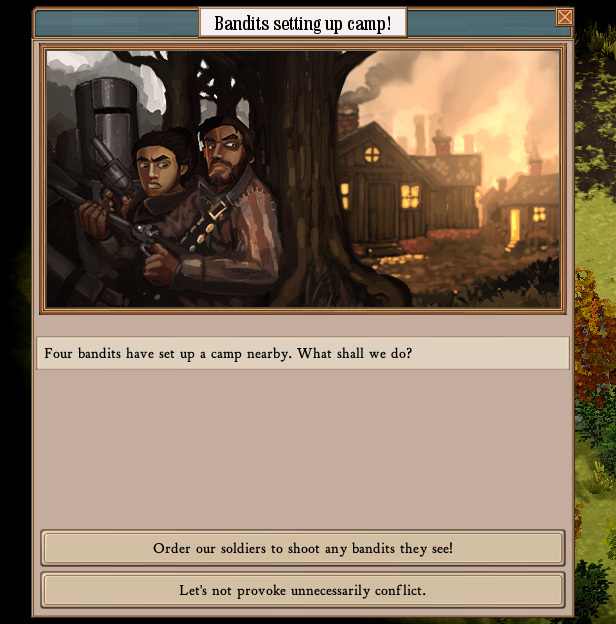 A simple event from the current version of Clockwork Empires. Let’s first set the scene by reviewing what events do in Clockwork Empires. It’s simple: to the player an event is a dialog box with an image and text description explaining a situation. At the bottom are one or more options that allow the player to react to the event in different ways, or simply acknowledge it and close the window. On the game design side, we can trigger these events based on ongoing detection of all sorts of conditions from “is it nighttime” to “have you chopped down more than 40 trees” to “is there a living Colonist who has the ‘Scholarly’ trait”. Or a gameobject can simply fire an event off at an appropriate time, for example when an Aristocratic colonist dies. We can also easily identify loose ends in event chains that need to be fixed or implemented, like the FIXME here. He even categorized them nicely for us. Back to the Twine flowchart: Seeing our mass of content arranged like this allows us to consider where additional connections should be made. “Investigation” is a great example – this is an event chain where the player is in trouble with the Empire’s Colonial Ministry for some reason (and there are lots of ways planned to get in trouble) so an investigation takes place. Results vary on how the player responds. Perhaps they deny wrongdoing and attempt a cover-up of whatever they’re doing, perhaps they call in a favour to make it go away, or perhaps they burn the evidence and take the straight and narrow until the heat blows over. 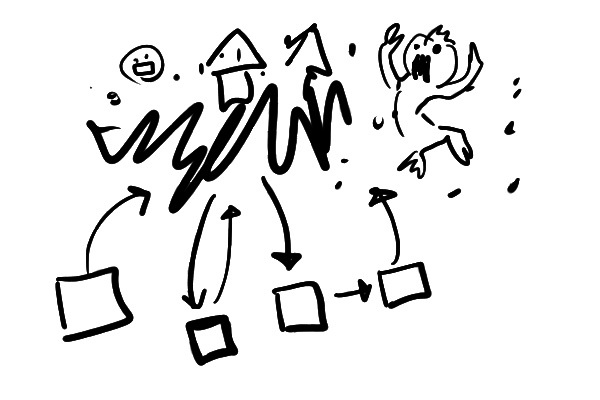 Twine lets us easily visualize event flow and even rapidly play through in a mockup from the perspective of the player. 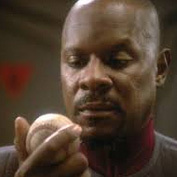 When viewing events as a flowchart or linear script it is sometimes easy to forget what has been set up in previous stages of the event’s narrative … not unlike the opening episodes of DS9 where Sisko has to get the wormhole aliens to understand his “linear” perspective. Twine is also fun to play around with in the sense of Storytelling As Game Design. Yes, it’s that blog post from years ago! 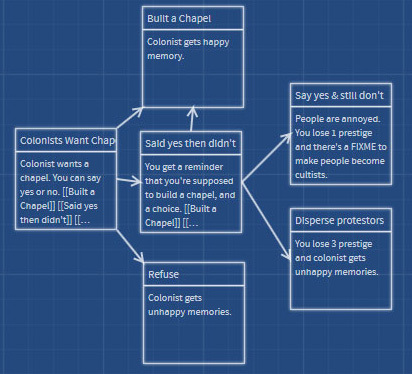 Twine enables the same thing but in the form of a make-your-own-terrible-bureaucratic-decisions story that embraces the concept of high-level player decision-making. I got a little too excited about this and made a Twine story/game to assist with planning out events surrounding how players can interact with Fishpeople. 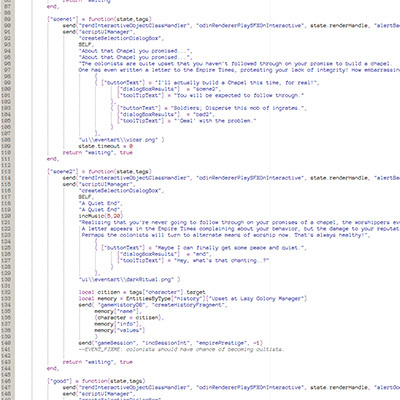 In conclusion, Twine is fun. And it’s going to assist us in making sense of the increasingly complex event chains of Clockwork Empires. Hu-za! Forgive that Outburst, I was Overcome with Glee. I do indeed look Fore-ward to to the Upgrade of the game, and to Further Upgrades. I was also Delighted with the “Fish-men in Paradise” text game. I like how the game goes back and forth between communist cabbage cults and totalitarian nazi death camps. Oh jeez; fixing that right now!